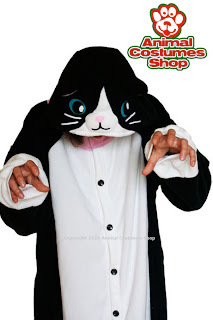 Animal Costumes Blog: What is a kigurumi costume? What is a kigurumi costume? Kigurumi is a Japanese phrase, meaning 'a stuffed toy that you wear'. Which says alot about what a kigurumi costume is already. Many kigurumi outfits represent animals, always with a cartoony or stuffed toy look about them. Other kigurumi outfits represent cartoon characters, both popular and make-believe. The phrase encompasses great big outfits padded to give an unhuman shape - such as the performing plonkers you might expect to see wondering about in Disney Land and also much smaller scale costumes. The smaller scale outfits are sometimes known as 'disguise pyjamas' or 'animal pyjamas' . These are often light-weight all-in-one jumpsuits, with a hood to give the wearer a new identity. As long as a costume looks cartoony or stuffed-toy like, it pretty much counts. In Japan, kigurumi animal pajamas have become fashionable streetwear, and it is not unusual to see the latest manga characters or a tiger walking down the streets of Tokyo late at night. Or early in the morning come to think of it. These costumed idivduals are known as 'kigurumin'. In the west a similar craze exists, known as fursuits, furplay or furries. Although this has yet to venture out from close-knit conventions and private parties into the realms of street wear, largely due to the prevalance of the Disney-style padded costumes. Difficult to negotiate narrow doorways, you might imagine. 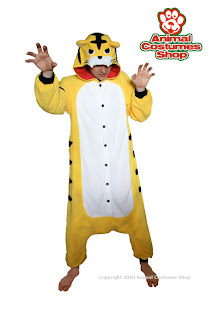 At the Animal Costumes Shop we stock kigurumi of the animal pajama variety. These all in one baggy outfits with character-hoods look great on the UK festival circuit and will keep you nice and warm too. We also stock kids sizes and the kids love 'em. See some pics below. Visit our shop to see our full range of kigurumi animal pajamas.